If you’re like me, you never really stop working. At the very least, you’re always thinking in the back of your mind about how to best work through problems. This is a blessing (and sometimes a curse) — but it does mean that good ideas can show up anytime, regardless of where you are. Here at Redbooth, we have team members in Silicon Valley; Barcelona, Spain; and Vancouver, Canada. We’re constantly on the go, traveling, and spending more time working while out of the actual office. Many of my best ideas come to me when I’m outside of the office. If I don’t capture those ideas, I either forget them — or worse, remember but never act on them. There’s a little-known feature in Redbooth that helps me capture and act on some of my best ideas. I’m excited to share it with you too. When I’m at home or traveling, I love to use the Redbooth mobile app. But sometimes circumstances call for another kind of solution — like, say, when I’m 12 miles into a long run. I am an avid runner. 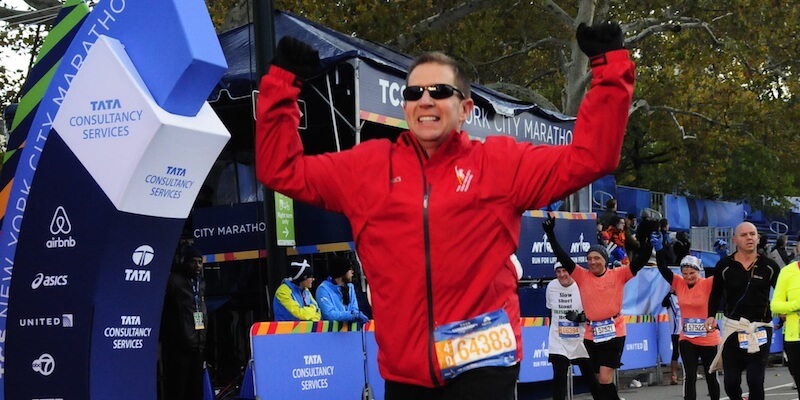 Some of my greatest ideas come to me during especially long runs — and in fact, the idea for this post came to my while running the New York Marathon. I captured it using these three simple steps below…. 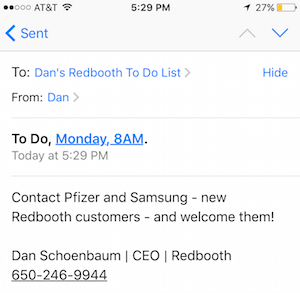 Of course, I’m a member of many Redbooth workspaces where I collaborate with team members, partners, investors and customers. I have benefitted greatly by creating my own personal workspace. I am the only member. You can add a close partner or administrative assistant if you think that will help you. Creating it should take you less than a minute, and you only have to do it once. From the Redbooth workspace, click on the gear icon near the top of your screen. Next, click on “Use via email.” You’ll see the customized email address to create a new task displayed on the screen. When I’m on a run and I have an idea or think of something that I need to assign or follow up on, I open a new email on my iPhone and dictate the message out loud using the built-in speech to text capability. Admittedly, I have to slow my pace a little bit in order to talk to my phone (and it isn’t that fast to begin with), but it’s worth it. I can follow up myself or assign it to somebody on my team. It also appears in my Redbooth dashboard, so I can’t miss it! This simple process has worked wonders for me, especially since some of my best ideas of 2015 came to me while running, traveling or somewhere outside of the office. I urge you to give it a try and let me know how this productivity pro tip works for you.